Ever wondered why Hollywood movies earn over 100 million USD whereas Bollywood movies have failed to earn even 100 million USD. I have did some investigation and tabulated the difference. A few films about 100 are produced in Hollywood. Out of the 100, 80 are good. Since very few films are released so each film is very original, creative and idealistic thus positively acclaimed by major Critics. Thus more people prefer to watch Hollywood, one of the major reason why Hollywood movies gross over 100 million USD. Over 1000 of films are produced in Bollywood out of which 900 are flawed. Most of the Bollywood movies are limited to our own country and thus can't gain International status. Indian films lacks originality. Mostly Indian people only watch Bollywood movies. Bollywood movies are limited to India and selected few countries. They are of low budget. Thus they are not able to earn much. Tickets price of Hollywood movies is quite high around 30 $. That's around 1500 INR. Tickets price of Bollywood movies is quite low, around 100-200 INR. Hollywood movies are action filled and shooted with high-quality cameras. Hence they are released in 3D and IMAX formats resulting in increased incomes. A few of the Bollywood movies are only released in 3D. Bollywood movies are generally comedy or romance based thus not able to make good profits. Hollywood movies are released in over 50,000 screens all around the world. Bollywood movies are released in only a few thousands screens which are not able to attract much audiences. Hollywood movies face less Movies Piracy. As compared to Hollywood movies, Bollywood movies face more challenges to Piracy. Thus their income is impaired. 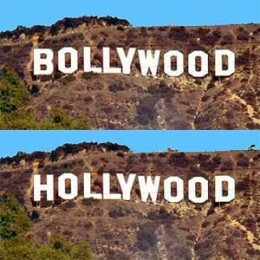 Hollywood has emerged over 150 years ago but Bollywood has emerged around 100 years ago. Thus Bollywood need more time to reach the status of Hollywood. Hollywood movies are of High budget but Bollywood movies are of low budget. So if we calculate the ratio of their film grosses, Bollywood is no less than Hollywood. For example, if a 100 million USD Hollwood movie grosses 400 million USD and a 20 Crore INR Bollywood movie grosses 80 Crores INR, the ratio is quite the same. Bollywood movies are generally based on the genre of romances and comedy. But Hollywood movies are based on action, drama, comedy, suspense, thrill and fiction. Thus if their genre is different then how can we compare them? Beautiful photos, really amazing, Bollywood have cute and gorgeous actress.